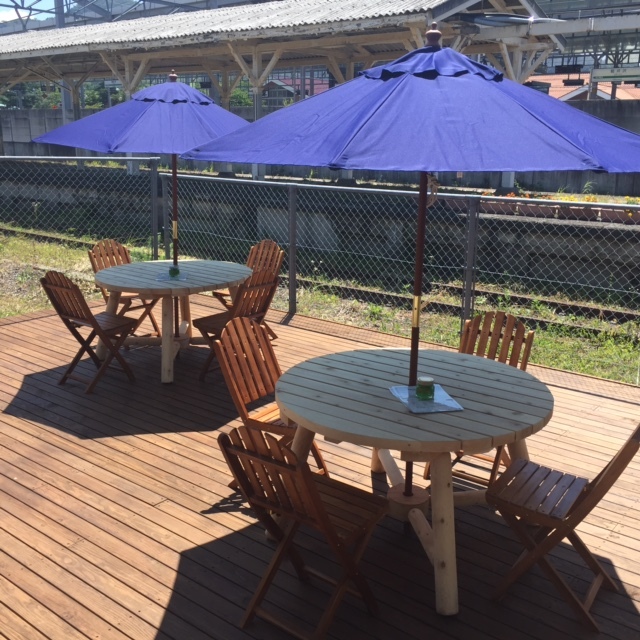 On a stopover in the fashionable mountain resort town of Karuizawa in southeastern Nagano prefecture, we noticed a stylish new wine bar that would easily win the award for “most ingenious use of a disused railway platform” – if there were such a prize in Japan. With its understated shop front, Au Depart is conveniently located just outside the Karuizawa station building but within the station compound. 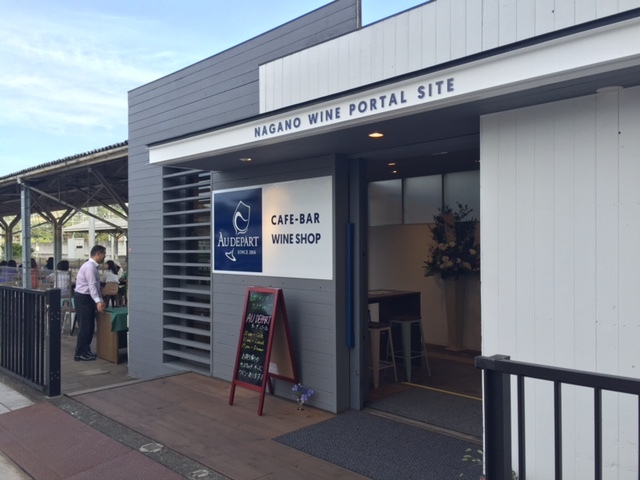 The entrance to Au Depart with a confusingly badged ‘Nagano Wine Portal Site’ sign across the entrance. 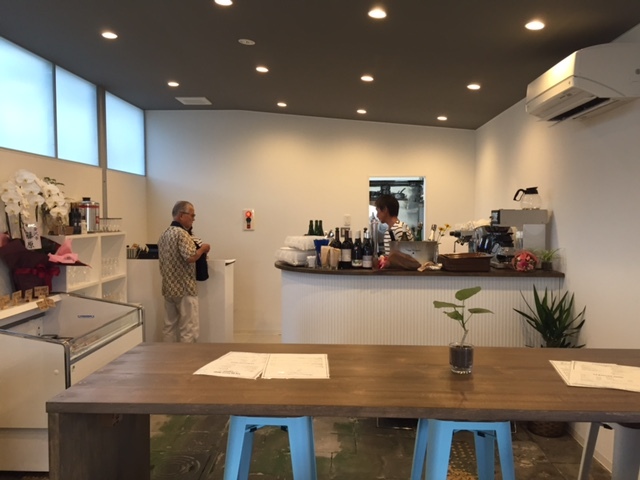 The brainchild of some local winemakers and a wine-loving entrepreneur, the goal of the combined bar, café and wine shop is to introduce visitors to locally-made Nagano wines and offer hearty Western-style snacks and meals featuring vegetables, meat, fish and other produce from Karuizawa. Au Depart only opened its doors on June 30 but was buzzing with diners and drinkers when we dropped in on a recent Saturday afternoon. Diners (and drinkers) enjoy al fresco drinks and meals on the unlikely terrace of Au Depart. On a mild, sunny day, the al fresco dining option beckons, with simple but well-designed stools and tables arranged along a small brick platform, with a wooden terrace to one side. The platform was built for the now defunct Shinetsu line, which was recenty replaced by the Hokuriku shinkansen (bullet train) line stretching from Tokyo to Kanazawa to the northeast. 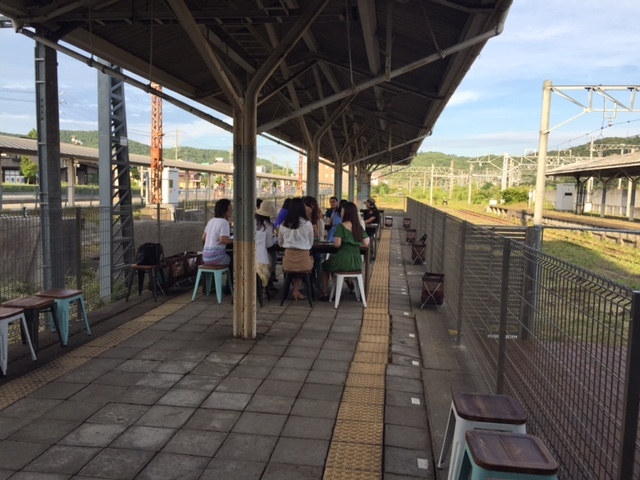 Al Fresco dining next to the train tracks at Karuizawa station. For colder months, the minimalist, light wood interior with comfortable bar stools, a counter and an impressive display of local wines, is an attractive alternative. Combining old and new with taste and style. 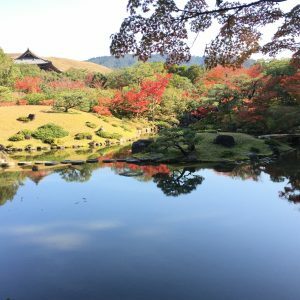 Operated by the Karuizawa Wine Portal, a company run by a local wine maker and partners, Au Depart offers about 40 wines made in Nagano by about 10 of the prefecture’s 32 wineries. These range from affordable, “easy-drinking” merlots, blended whites and even cider to more upmarket pinot noir, sparkling wines and chardonnays. 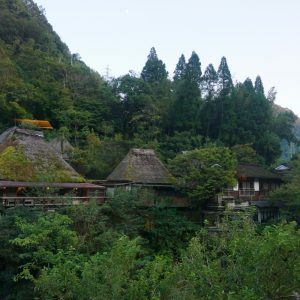 Before wine snobs rush to dismiss Japan’s local wines they should visit wineries (and shops like Au Depart) in Nagano and Yamanashi prefecture among others, to realize that Japanese wine makers have improved by leaps and bounds – and are starting to make a mark. 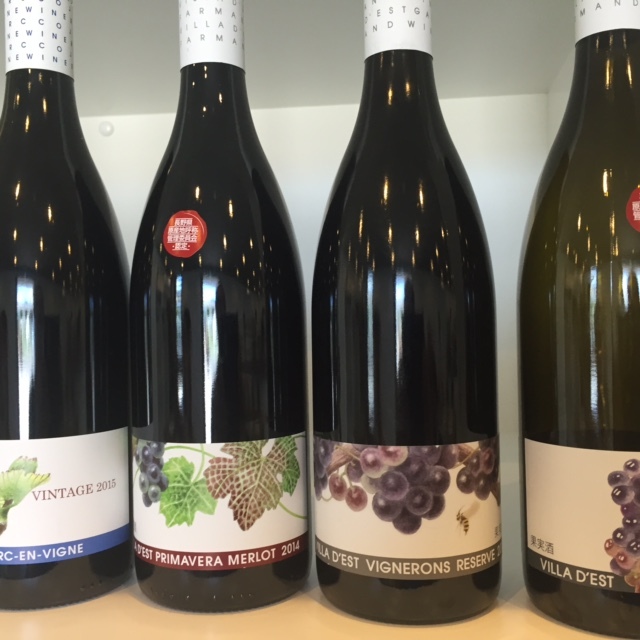 Wines from Villa D’Est Garden Farm and Winery in Nagano on display at Au Depart. 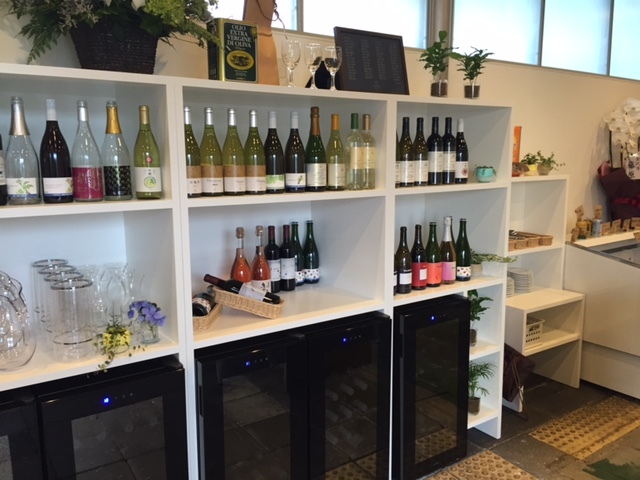 To advance its aim to introduce people – particularly tourists – to wines of Karuizawa, one savvy feature of Au Depart is the availability of wines in 200-milliliter containers, for those who don’t want to lug a bottle back to Tokyo. The 200ml tipple is just right for the brief 70-minute shinkansen journey back to Tokyo – or for a welcome drink while you wait for the relentlessly long taxi queue to clear. Prices are very reasonable with lower markups on wine purchases than you encounter in local restaurants. 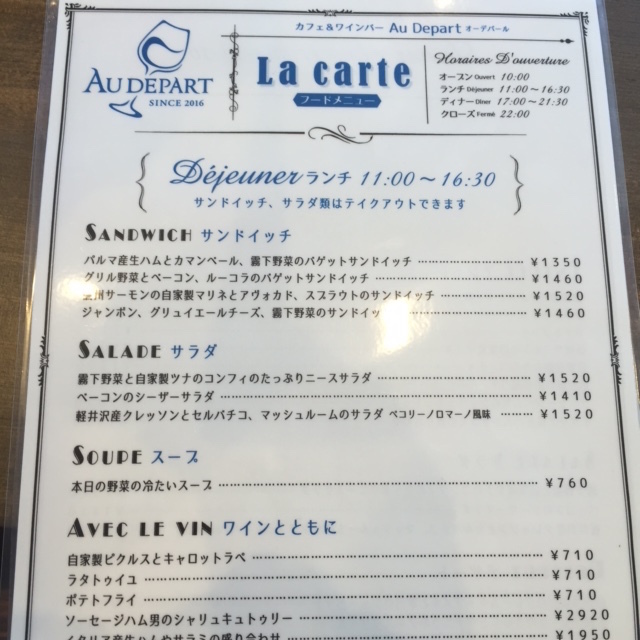 Au Depart carries about 40 selected wines and cider from local Nagano wineries. The bar and wine shop at Au Depart are open from 10am to 10pm and food – ranging from large platters of charcuterie to marinated salmon and salad — is served for most of the day. The menu at Au Depart is simple but varied. 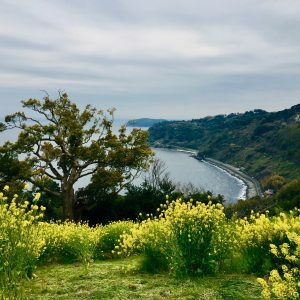 The venture has made a good start, and if it can continue to draw curious (and thirsty) wine lovers and foodies, with growing interest in Japan’s local produce, Au Depart could well become a model. The model would be not only for local producers to promote their products through similarly well-conceived establishments, but also to add contemporary style to regional Japanese railway stations. 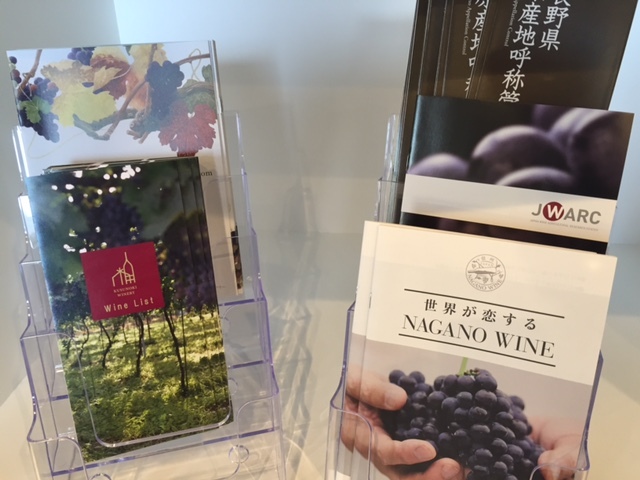 With its exclusive focus on wines produced in Nagano, Au Depart provides literature covering most of the prefecture’s wineries.